A renal biopsy is a procedure used to extract kidney tissue for laboratory analysis. The word “renal” describes the kidneys. A renal biopsy is also called a kidney biopsy. Biopsy is performed on one kidney. The patient lies on his or her stomach on a firm table with cushioning under the abdomen for support and must not move during the procedure. Once the kidney is located with ultrasound or CT scan, the biopsy site is marked over the right kidney and a local anaesthetic is injected. 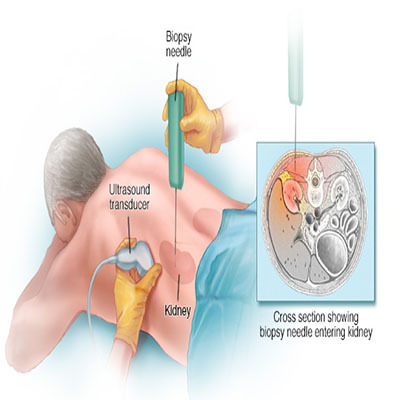 Once the area is numb, the nephrologist uses ultrasound to view the kidneys in real time and guides a spring-loaded biopsy needle into the kidney. The needle removes about 5 to 15 glomeruli. Two or three samples are usually required, each the size and shape of one-half inch of string. After the core tissue samples are extracted, pressure is applied to the incision to slow bleeding, and a bandage is placed on the wound.